It's CPR is an exciting new resource that brings together musical inspiration and medical expertise to fire up the imagination and make teaching CPR in schools a fun, informative and rewarding experience that might, one day, save a life. So far, the thousands of children who have been involved in CPR training have started by learning the songs and rap from It's CPR! These songs are enhanced by musical activities that teachers can integrate into their curriculum. The songs are scientifically and clinically accurate and written at a speed of 100 - 120 beats per minute so that children know what to do and the correct speed to perform CPR. Music Hubs using It's CPR! have visited schools to support the vocal learning as part of the Hub's vocal strategy and to prepare the children for the CPR training. These sessions have been followed by a visit from local medical professionals. There is an assembly for all KS2 students at the start of the day, followed by 30 minute workshops for each KS2 class. At the end of the day there is staff meeting which can also be followed by a session for parents. In 2016 a spark was ignited when medical professionals met with the Hub to discuss how to engage schools in CPR training. The Hub suggested that to engage schools and enhance the learning experience, using music would be a winning means of success. Portsmouth Music Hub composer, Iain Gilmour, composed a set of exciting and informative songs and a rap to help children remember how to perform Cardiopulmonary Resuscitation (CPR). 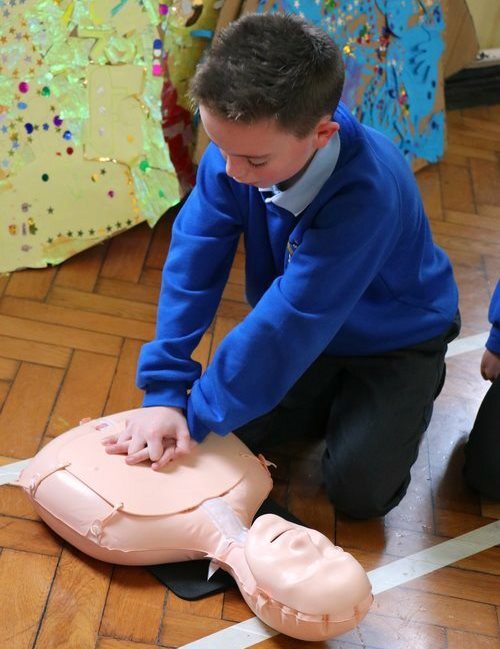 It's CPR provides the tools to enable teachers, parents, children and medical professionals to work together to learn life saving skills with specially composed songs, engaging teaching techniques and exciting musical activities.